Japanese Prime Minister Shinzo Abe on Monday made a number of pledges including to create a viable social welfare system, deal with the impending impact of a planned tax hike and resolve a territorial dispute with Russia, and apologized for faulty surveys conducted by the labor ministry that hammered public trust. 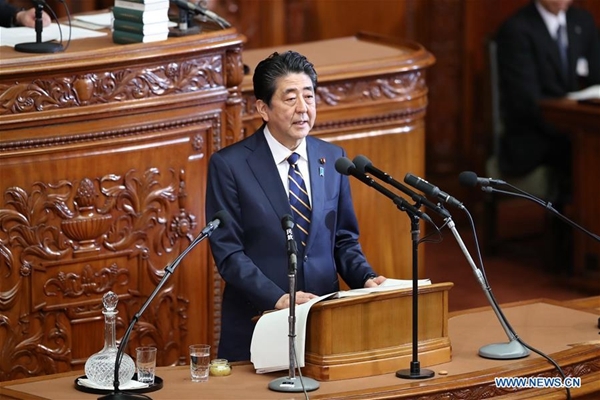 Abe's policy speech came on the first day of the new Diet session and set the tone and course for the prime minister as he starts to gear up to pitch to the electorate ahead of this summer's upper house elections. On the upcoming consumption tax hike from 8 to 10 percent that will take effect on Oct. 1 this year, Abe underscored the need for the hike, citing Japan's problematic demographic issues and the costs needed to address them. "We absolutely need to secure stable fiscal resources by lifting the consumption tax rate in order to overcome the issue of an aging population and declining birthrate and create a social security system that can benefit all generations," the prime minister said. In 2014, when the consumption tax was raised from 5 to 8 percent, the economy entered a technical recession, a point of concern among the populace that Abe vowed to do his utmost to mitigate. Abe, whose "Abenomics" blend of economic policies has spurred economic growth, but done little to reverse decades of deflation or fundamentally address the structural reforms necessary to fully restore the nation's dire fiscal health, said the government will "take all possible measures to keep the economy on track." Abe referred to mechanisms to be put into place to ensure allocations from the increased tax revenue go to support low income households with children by providing free preschool education and subsidized shopping vouchers. On foreign policy, Abe, who held talks with Russian President Vladimir Putin in Moscow last week, said both Putin and he himself were keen to resolve a decades-old territorial dispute that had meant both countries have yet to sign a peace treaty after World War II. Abe vowed to settle the issue and expressed his determination, along with that of Putin, to sign a peace treaty, stating: "I share a strong determination with Russian President Vladimir Putin not to leave the issue unsolved now that it has been more than 70 years since the end of the war." As for the Democratic People's Republic of Korea (DPRK), Abe said that Japan would continue to cooperate with the United States and South Korea as necessary. A scandal which has rocked the labor ministry involving the improper collection of data necessary for the ministry's monthly labor survey, dating back more than a decade and resulting in more than 20 million people not receiving their full benefits, has shocked the public and necessitated the prime minister's attention on the first day of the new Diet. "I'm aware that the faulty surveys conducted over many years have violated people's trust in social security," said Abe. The opposition camp stands poised to attack Abe's ruling Liberal Democratic Party-led bloc over the issue as it has implicated top bureaucrats and officials in the ministry. "I apologize to the Japanese people for this. We will reimburse underpaid unemployment benefits and workers compensation as swiftly as possible using simple procedures," the prime minister said. Regarding Abe's contentious plans to amend Japan's pacifist charter for the first time since WWII, despite his party failing to put together proposals on the issue during an extra Diet session last year, the Japanese leader said he intends to push ahead with his plans to potentially come into effect in 2020.